SHANGHAI, China, 18 December 2018 – The United Nations Population Fund (UNFPA) today announced a new project in Shanghai to promote youth leadership in countries along the Belt and Road. “We believe that when empowered, young people become effective drivers of change. UNFPA works across the world in more than 150 countries, including China, to ensure that all young people have the information and services to guarantee their healthy development, and are availed opportunities and capacities to lead and participate in the development process and its benefits,” said Dr. Babatunde Ahonsi, UNFPA Representative in China. Through the two-year project, young people will be able to participate in trainings on leadership, youth health and communication skills, decision making, and understand global development issues including the Sustainable Development Goals. A youth friendly club will be established in Shanghai Lida University to support the project. 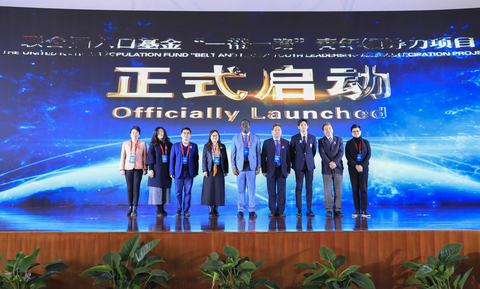 “It will provide young people with an international platform to communicate and learn from each other, strengthen youth leadership, promote youth participation in international affairs, and the globalization and internationalization of higher education,” said Professor Wu Baode, Vice President of Beifang International Education Group. The youth leadership project will carry out demonstration activities with an aim to replicate them elsewhere and scale them up to other cities and countries along the Belt and Road.